Where do I start? Is there any doubt that Woody Allen is a genius? Is there any doubt that Cate Blanchett is an absolute powerhouse? Of all the films I have seen over the past while, this one resonates with me the most. But the reason why is interesting. This is a synopsis and a bit of a spoiler but I don't believe this will in any way detract from seeing the film. It may better entice you to see it. 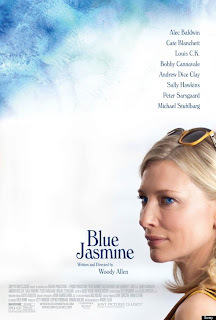 Jasmine (Cate Blanchett) has her entire life of untold wealth and dreams in New York come crumbling down. Destitute, she has run out of all options and is forced to go live with her relatively poor, working class sister Ginger (Sally Hawkins) in San Francisco. The current story moves forward interspersed with flashbacks explaining the background. Wealthy businessman Harold "Hal" Francis (Alec Baldwin) is a Bernie Madoff character having build a house of cards on shady deals. At one point, Jasmine asks her husband why a lawyer has bowed out of agreement saying he, the lawyer, would go to jail. It turns out though that Hal ends up behind bars where he supposedly commits suicide. The government takes everything and Jasmine is left with nothing. Slowly, as Jasmine attempts to start another life, we find out how Hal continuously cheated on his wife and betrayal is a theme throughout the film. We discover how Jasmine had a nervous breakdown and as well as medication, had shock treatment in an attempt to get her boat righted. But the straight and narrow is also a difficult path. A fortuitous meeting at a party sees Jasmine meet a man who could possibly be her a ticket out of her hellhole but like her former husband, she lies to built an artifice of deception and loses her opportunity by betraying the man who could be her next husband. Have you been married? Have you been divorced? Have you felt the sting of betrayal? Have you had your heart ripped out of your chest then stomped on by the caprice of fate? Never mind the summer blockbusters. Never mind whatever scary boogie man may be tickling your horror funny bone. This hits home as this is you. This is truly scary. This is your life. This is the gambit of emotions of anyone who has gone through a romantic tragedy. You are driving by a car accident, slowing down to look wide-eyed out the window possibly saying to yourself, "There but for the grace of God." Ginger's ex-husband Augie, a construction worker, wins the lottery, two hundred thousand dollars, and gets talked into investing it all with Hal. Obviously Augie loses it all and loses his once in a lifetime opportunity of bettering himself by starting his own business. The story of another poor guy who lost it all because of Bernie Madoff and other Wallstreet types. (see my blog: Alexandra Penney: she was "madoffed") Who did Woody Allen get to play the part? Andrew Dice Clay. Wait. The Andrew Dice Clay? Yes, and I have to say he was perfect for the part and did a fabulous job. This is a terrific film. Forget all the blockbusters. Forget Elysium. Forget The Wolverine. For the love of God and all that you hold sacred in life, don't watch Pacific Rim. If you are over 40, you more than likely will have enough life experiences to not just "get it", but to "feel it." The sting of betrayal? The taste of defeat? The horror of having your entire life pulled out from underneath of you? I saw one person call it a comedy. Another called it a drama. I even heard the term "dramedy", a combination of the two. Whatever the case, there are moments where you will chuckle but overall, you're going to be shaking your head while quietly saying, "Whew." Woody Allen has crafted a fascinating story and Cate Blanchett is just superb. Blue Jasmine is a 2013 American drama film written and directed by Woody Allen. It was released on July 26, 2013 in New York and Los Angeles. my blog: Alexandra Penney: she was "madoffed"
Ms. Penney documented her experiences post financial loss in a series of articles entitled The Bag Lady Papers which were published in The Daily Beast, an online news website. Starting from the moment she first heard the news, to the realisation that everything she had invested with Madoff had just disappeared, she tells of her life and how she got to where she was. Do you like to go for the big summer blockbusters? Sometimes smaller is better. You're 27. You're out of school. You have a job; you don't have a job. You share an apartment; you move in with other people. Life is transitory. Do you have a plan or is life just happening? Meat and potatoes. No big budget special effects. No eye candy. An excellent story with well thought-out characters. This is an odd, truly quirky story but the critics are right, this is a good film. And imagine, no car chases, no special effects, and no explosions. Okay, we see some tempers explode a couple of times but there are no pyrotechnics.